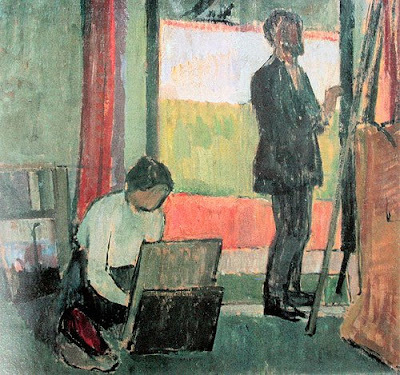 Two Vanessa Bell paintings of painters painting. The first painting is from her Asheham House – Bloomsbury days. Virgina Woolf, Lytonn Strachey, Roger Fry, Meynard Keynes… Bloomsbury was a meeting of minds & personalities. Literary, social, artistic & economic questioning & creativity to create one of Britain’s most brilliant schools of painting . 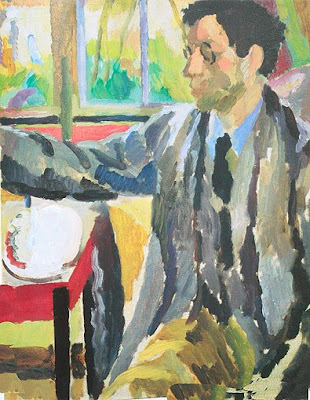 A sense of communal purpose… and a disffusion of Modernism into English speaking countries( Roger Fry acquired many avant-garde paintings for various New York museums in his role as advisor). On or about December 1910, human character changed. – Virgina Woolf. -The flashing brillance…the pidgeon breast radiance Virgina Woolf, writing in a letter about her sister’s , Vanessa Bell, use of colour. YOU ARE INVITED TO PARTICIPATE IN AN INTERNET COLLABORATIVE PROJECT…. All levels welcome, from genius to absolute beginner.